Grill and Barbecue Like a Pro! Pull up a lawn chair, sit back, and taste a perfectly barbecued meal while you enjoy the summer from your own backyard. Nothing is better than cooking outdoors, especially when you’re making a great meal for family and friends. You don’t even have to stop when summer’s over because you can grill all year. Woodstock Hardware has a complete supply of grills and barbecue necessities. 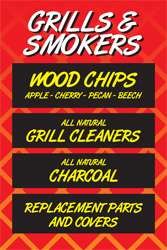 We stock a variety of Weber charcoal grills and we special order gas grills on a weekly basis. If possible, we suggest that you review our corporate website to find the grill that best suits your needs. 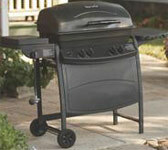 We also carry a complete selection of grill and grilling accessories. 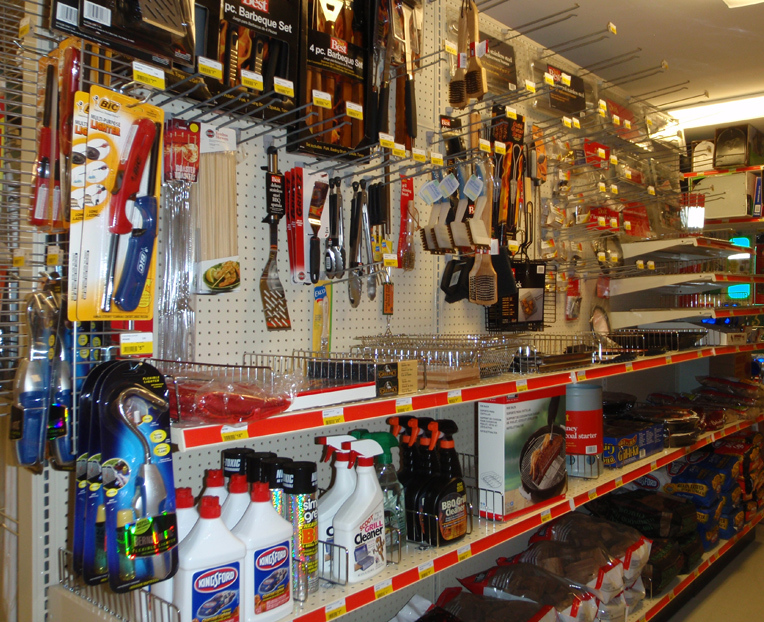 Woodstock Hardware has a complete supply of grills and barbecue necessities. As a service to our customers who purchase a Weber gas grill, we will assemble and deliver it, with a full tank of propane, to your home. We will even take a few minutes and walk you through operation to make sure you are completely satisfied with it. This way after we leave, all you need to do is throw on the steaks and enjoy your new grill. 1. Cleaners. Use a good grill cleaner to remove the buildup from your constant use or the dirt and grime accumulated from sitting idol through the winter. I suggest using Goo Gone Grill Cleaner (803049), a good natural plant based citrus power cleaner that you can use on your grilling surface as well as your cast iron, stainless, baked-on porcelain, and enamel cookware. And don’t forget a good scrubber like Weber’s Grate Grill Scrubber Pads (800509) to make your clean up easier and faster. 2. Replacement parts. Need to bring that old grill back to life? Woodstock Hardware has a complete line of replacement grates, auto starters, burner assemblies, and covers for your grill. Ordering special parts is not a problem. 3. New Grills. If it is finally time, Woodstock Hardware can set you up with a new charcoal and gas grill; just in time for the summer barbecuing season! With a variety of grills in stock, we also receive orders twice a week so there will be no delay in getting the grill you want. Plus, we know the tricks that some big companies use to try to think you are getting the same quality grill at a cheaper price. Remember you really are only getting what you pay for! For our Rewards card customers, we assemble and deliver your grill for free. So, stop in and sign up! It only takes 60 seconds and it is FREE! 4. Grilling Utensils. We have them all. Spatulas, tongs, thermometers, mitts, basting brushes; you name it we have it! Not only the good old stand bys, but in Diane’s Kitchen there is a wide range of cooking and grilling utensils for you to choose from. I personally love Weber’s Fish Turner spatula. 5. Grilling Tools. Our customers are “sophisticated grill chefs” and use their grills to cook a wide range of food well beyond hamburgers and hotdogs. 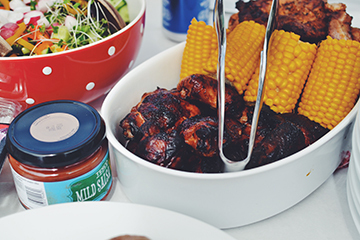 We can help you be the talk of the weekend get together. We have: cedar planks to grill fish, stainless steel vegetable baskets, rib & roast racks, and even pizza stones and woks designed to use on the grill. Don’t overlook that many people use their cast iron cookware to cook on the grill. Don’t have any cast iron cookware? Diane’s Kitchen stocks a wide variety of cast iron cookware including Dutch ovens, griddles, grill pans, and fry pans, just to name a few. So, if you cook it inside, odds are you can cook it outside and thoroughly enjoy doing so. If you partially cook food in the microwave or on the range, immediately finish cooking the food on the grill. With the supplies we carry and these expert tips, we are sure you will enjoy your backyard cooking all summer long. To help explain the best way to cook a burger I asked my brother-in-law, Kevin Christofora, former owner of Woodstock Meats, for his thoughts on how to craft that perfect burger. Why not start at the source I thought? Diane of Diane’s Kitchen had some great input too. 1. Start with the right meat. 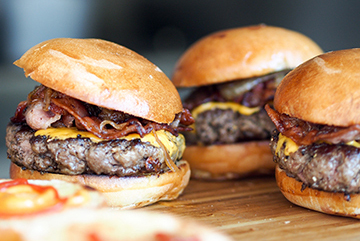 “Everyone has an opinion, but look for burger meat with a fat content of about 10-15 percent,” said Kevin. An easy way to get that is make a mixture of half ground chuck and half ground sirloin. Remember, the fat is where the flavor resides in any meat. So the more fat you have, the more luscious it will feel in your mouth. “But don’t use too much because you don’t want to bite into a mouthful of grease,” added Kevin. 4. Prevent sticking. Make sure your grill is clean, hot, and oiled. About 450 degrees is good or until you can’t hold your hand about 1 inch above the grate. Lightly brush the burgers on both sides with extra-virgin olive oil just before grilling. This helps to prevent sticking and adds a little flavor. 5. No pressing. “When grilling your burger do not press on your burger with a spatula,” said Kevin. All this does is squeeze out the juices onto the fire causing flare ups and dry burgers. 7. Grill overcrowding. Follow the “30 percent” rule. 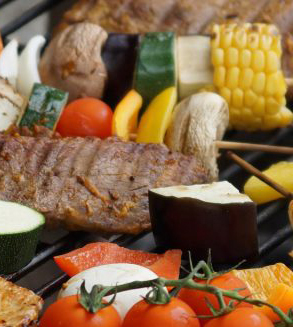 Leave 30 percent of your grill free of food. That way if you get flare ups, you have a place to move the burgers so they don’t burn. 9. Let the burgers rest. Sit your burger off the grill for a couple of minutes before serving. This allows the meat to “relax,” giving you a juicier burger. Diane and Kevin know that following these easy steps will lead to a summer full of great burgers. Once things get going don’t be afraid to replace the beef with ground chicken and try your hand at making delicious chicken burgers. Friends and family will love them.